"We fully stand behind the Fish & Wildlife Service's authorization for this project. We believe the agency thoroughly addressed the issues in this case in the revised Biological Opinion and new Incidental Take Statement in September. In developing this project over the last four years, we have taken extraordinary care to protect the sensitive species at issue in this case. We will vigorously defend the agency's decisions and the measures we've taken to protect the species in oral arguments before the court in March. "The issues in this case involve a narrow scope of the project – only four species that occupy roughly 100 miles in West Virginia and Virginia. We voluntarily suspended work on the project in early December after the Fourth Circuit temporarily stayed our revised Biological Opinion and new Incidental Take Statement so that we could get clarification on the impact of the stay order. The court's denial of our request to clarify the stay order is an interim order and not a decision on the overall merits of the case. "Public utilities are depending on the ACP to generate cleaner electricity and provide more affordable, reliable energy to millions of consumers and businesses. Delaying the project will only force consumers and businesses to pay higher energy costs and slow down the transition to cleaner energy. Consumers are already paying higher energy costs than they should and major industries are having their natural gas service shut off during the winter months. We cannot solve these challenges without new infrastructure." 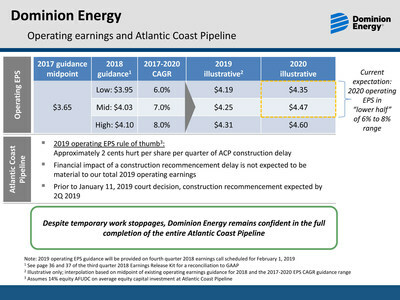 Additional information pertaining to the company's operating earnings guidance as provided in the January 10, 2019 investor materials can be found in the graphic herein which will also be available on the Dominion Energy Investor Relations website under the title "Investor materials --- January 2019 Supplement" at the following link: http://investors.dominionenergy.com/events-and-presentations. This release contains certain forward-looking statements, including forecasted operating earnings for full-year 2018 and beyond which are subject to various risks and uncertainties. Factors that could cause actual results to differ include, but are not limited to: unusual weather conditions and their effect on energy sales to customers and energy commodity prices; extreme weather events and other natural disasters; federal, state and local legislative and regulatory developments; changes to federal, state and local environmental laws and regulations, including proposed carbon regulations; cost of environmental compliance; changes in enforcement practices of regulators relating to environmental standards and litigation exposure for remedial activities; capital market conditions, including the availability of credit and the ability to obtain financing on reasonable terms; fluctuations in interest rates; changes in rating agency requirements or credit ratings and their effect on availability and cost of capital; impacts of acquisitions, divestitures, transfers of assets by Dominion Energy to joint ventures, and retirements of assets based on asset portfolio reviews; receipt of approvals for, and timing of, closing dates for other acquisitions and divestitures; changes in demand for Dominion Energy's services; additional competition in Dominion Energy's industries; changes to regulated rates collected by Dominion Energy; changes in operating, maintenance and construction costs; timing and receipt of regulatory approvals necessary for planned construction or expansion projects and compliance with conditions associated with such regulatory approvals and the inability to complete planned construction projects within time frames initially anticipated. Other risk factors are detailed from time to time in Dominion Energy's quarterly reports on Form 10-Q or most recent annual report on Form 10-K filed with the Securities and Exchange Commission.